Fully restored vintage Bertoia Diamond Chair by Knoll. (2) Available. Our team used the original pattern to recreate a new cover in beautiful plum colored Knoll tweed fabric. Original tag has been sewn into the new cover. A fully upholstered cover adds softness and texture to the graceful lines and industrial beauty of Harry Bertoia's classic Diamond Chair. 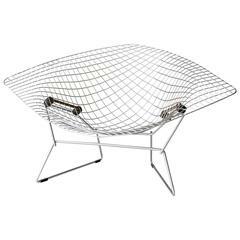 Bertoia’s wire chair collection is among the most recognized achievements of mid-century modern design and a proud part of the Knoll heritage. Minor oxidation on frame. Full cover has been recreated in plum tweed fabric by our in-house upholsterer. 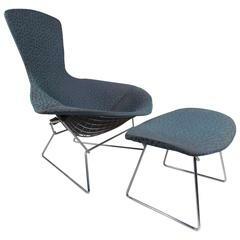 Diamond chairs by Harry Bertoia for Knoll International, 6 available Sold par piece 1200€. 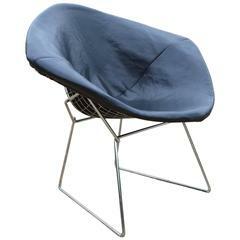 Diamond chairs by Harry Bertoia for Knoll International, 6 available Sold par piece 1250€.